Silk Painting Workshop at Talgai Hall, Llandygai Village. I taught my Silk Painting workshop in Talgai Hall, Llandygai Village. The hall stands beside the village church. The location is idyllic. It’s the perfect place to hold my workshops. 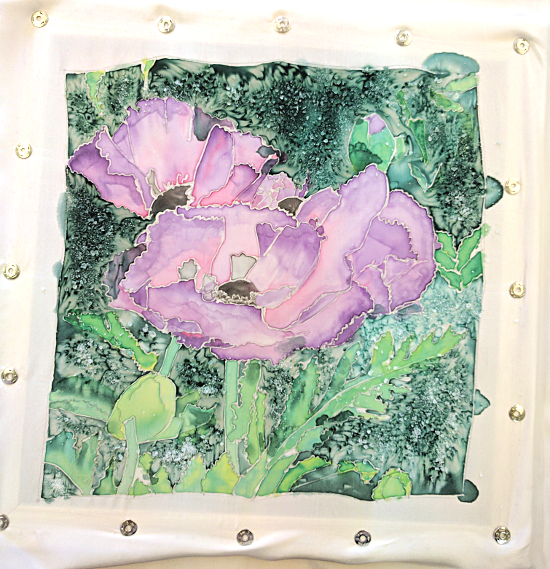 I love teaching silk painting. People who think they can’t paint, discover they can. I bring a selection of designs to the workshop, so the first task is to chose one and trace it onto a piece of silk. Next, the silk is carefully pinned ‘drum tight’ to a wooden frame. Gutta is gently squeezed along all the pencil lines to stop silk paint bleeding from one area to another. On Sunday, we left the gutta to dry while we had lunch. In the afternoon we began silk painting. One of the most wonderful things about silk painting happens at this stage. As you add paint to an area, it spreads to fill the space. It’s a little like magic. Silk is such a special fabric and it accepts the silk paint so beautifully. Salt sprinkled onto wet silk paint will add visual texture. Once dry the paint is heat set. Silk painting is the most lovely technique and it is brilliant when people leave my workshop saying how much they have enjoyed it. This entry was posted in Blog on 9 June, 2017 by admin.